I first got to know from Claire from her post on eczema. Thanks Claire! Anyway, I got my Marine Elements and started using them immediately. P/S, please ignore the dents on the intensive cream, it (the packaging) was crushed under the box when it reached me. You see, hubby has some red patches of eczema on his head, it's due to stress and it won't go away, the skin specialist says, but it can be controlled with medicine, cream and shampoo. Currently, he is using some green yucky slimy shampoo, I don't know what they contain, but the smell is very unpleasant. And hubby is using it for long term. I really don't know what will be the effects if used long term. But those has to do, to control the patches from spreading and getting redder. I, on the other hand, have mild eczema every now and then. There will be red patches on my face and neck and I'm currently using steroid cream bought from the pharmacy. Then Marine Elements came. It is a range of non-steroidal, paraben-free skin care products with active ingredient ZonaseX to help improve the appearance of dry, itchy, irritating and inflamed skin conditions, such as eczema and dermatitis. Marine Elements products are hypoallergenic and suitable for people of all ages, including babies, children and people with sensitive skins. Let's jump straight to the results, shall we? Some improvements you see there. Little by little everyday, fingers crossed. You can get know more about Marine Elements or if you want, you can purchase it from here. Sharing is caring! Hello dear.. Let me know your email, or you send me an email, I'll tell you more k? 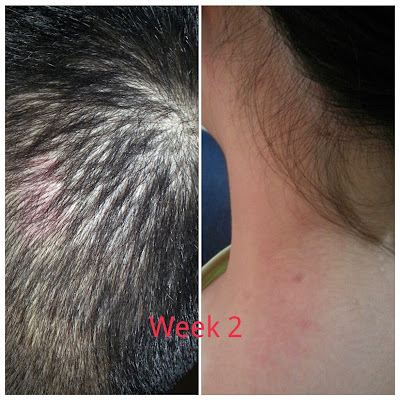 You can email to betsyyeo@livelife.com.my and tell her about your eczema problems, then she will let you know what to be done..
Wow, can see it improve a lot!!! Yeah, fingers crossed, improving now.. Especially hubby.. I see back his reddy bloody patch also I scared ahh..
My kid has severe eczema and he's using steroid products m I want to give this a try. Was searching in pharmacy but cannot find. She tell you what to do. I got mine pretty fast, within a week. Well, I bookmark the website and I will probably order online. actually i am very dumb with all the medical terms lah, i mean they are mostly latin mah, can be very confusing to me, so i google a bit and this is what i read on wikipedia, if anyone of the readers do not know what eczema is..
"The term eczema is broadly applied to a range of persistent skin conditions. These include dryness and recurring skin rashes that are characterized by one or more of these symptoms: redness, skin swelling, itching and dryness, crusting, flaking, blistering, cracking, oozing, or bleeding. The cause of eczema is unknown but is presumed to be a combination of genetic and environmental factors. Treatment is typically with moisturizers and steroid creams. If these are not effective, creams based on calcineurin inhibitors may be used." so how well the steroid cream helps in your case?? i can see after two weeks of using the Marine Elements cream, your eczema is very well controlled and it's a big improvement!! i guess have to slowly see how it goes lah, usually all these things take time and you won't see promising effects by just one trial lah.. keep on applying and if it's better than the steroid cream, why not right?? because when i hear the word "steroid" i already have a feel that it's not something good woh.. hmmm, come to think of it, your "gluttony" could be due to applying the steroid?? 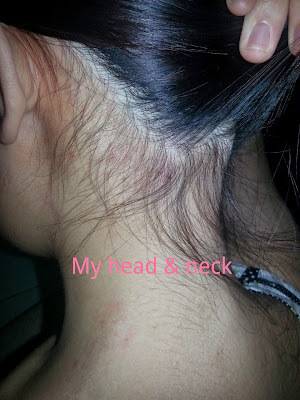 Eczema is very common now, it’s a type of skin problem lor, depending how bad only.. 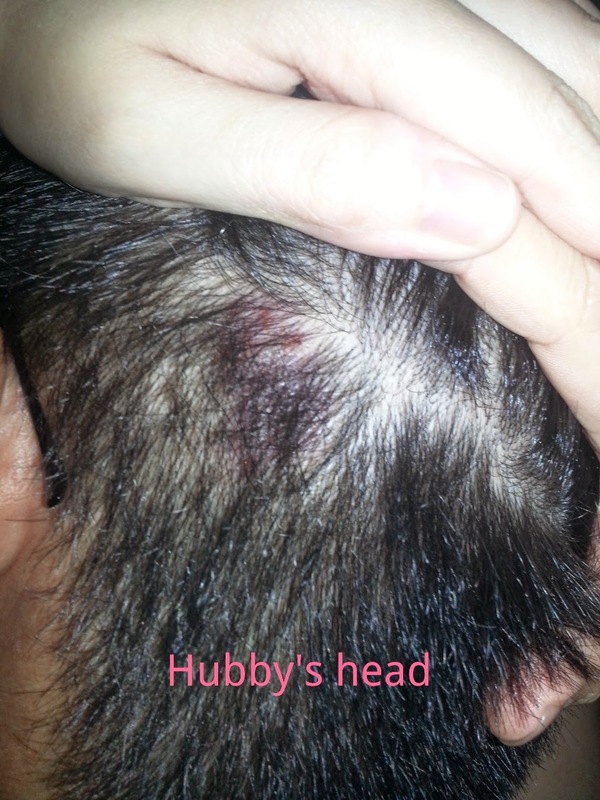 Some mild one, some very teruk case.. Like my hubby, almost became teruk case, but it was controlled by steroid jab, pills, shampoo and cream.. You see the red bloody patch, when he scratches, it will become reddy lor.. The skin doctor said it’s due to stress, it won’t go away one wor.. Stress = itchy = scratch = red = spread. I was worried also ga..
Woi, you nie, copy from wiki to make the comment look longer izzit.. Notti you.. I have mild eczema too coz it’s from my family, it’s in the family.. My dad has it, my sisters have it, I have it too.. The patches come and go, depends.. Sometimes it’s itchy, so when I scratch (and feel) it, then I know it’s there, so I applied my (regular) steroid cream.. Then the patch will be better, and I won’t itch again.. But then, it comes back every now & then..
Eh, I laughing now la.. My gluttony comes from the steroid cream? Hahahaha.. Just in case you wana know, I’m using Hydrocortisone and Elomet, steroid, but in very small % only.. I have to say it helps, if you want fast result.. 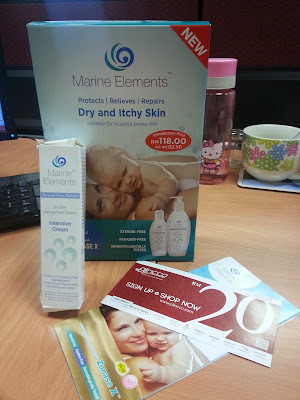 But since now I have the Marine Elements intensive cream, I shall stick to that in the meantime lor..
working or not the products? Yep, slowly working, but cannot immediately 100% kulit licin + back to normal la (especially for the hubby's head).. Coz the stress will be always there.. Thus, itchy, then will be redder, but it can be controlled now la, phew !! I thought your hubby always act like vampire and made your neck red! So it is in your family with itchy skin! I also have ugly reddish allergies that often appeared on left hand and sometimes on both hands. I could only use the strongest cream Dermovate to calm and soothe them to disappear. I suspect that I am allergic to certain food or maybe crabs - still unsure which one. Yep, I heard of Dermovate, quite a strong medicine, and I only use it if it's really bad. Else Hydrocortisone & Elomet work fine for me (before this la).. I have finished reading the website and I am convinced enough to buy one intensive cream to try right away! Thank you for ending my gatal skins! Why don't you email to Betsy @ betsyyeo@livelife.com.my first? Sweetie, yes she is giving out free trial products on the condition bloggers must review the product and blog about it.. She will need you to send her your pictures, depending on skin conditions and then decide which trial products to send to you..
Never mind la. I shy to send my naked shy. I will buy terus! Indeed Sharing is Caring... hahahaa... hope the products work for you!! Yep, sharing is caring, thanks Claire.. The skin looks so red! But less after application of the cream. So, is it itchy? Or painful? And say, after it heals, will it happen again? Sorry ah, so many questions. I am not familiar with this skin condition and no time to google :) Hope you and hubby recover from it completely. It's itchy.. Not painful.. Yep, after it heals it will happen again.. Come & go.. But it can be at least controlled with the cream now..
Not working for you. Your Skin turns red means that your skin is sensitive and the product used is not compatible. Thankfully it's working for hubby.. I got so worried looking at his red bloody patch. Now it's getting better.. It will still come & go, the skin doctor already said, but at least it can be controlled now..
Yeah, itchy skin is worrisome because if untreated it can get worse. Over the weekend a friend said she used Nixoderm to get rid of a bad patch of severe itchy skin after an insect bite. Nixoderm has actually been around for ages. It's the white cream in a green container which can be bought off the shelf at any pharmacy. Another cream recommended by a friend is Betnovate. She said it's very effective. Yet another to try is good old fashioned aloe vera, the actual plant. A colleague who used to have a severe case of acne after consulting with skin specialists one after another, finally got tired and tried the aloe vera from her garden. Her acne condition improved and she ditched all her doctors' prescriptions. What she did was to apply the aloe vera sap directly from the leave (if you can call it that) before she goes to bed and then simply wash it off in the morning. Voila! Smooth complexion again and no more acne problem. Not sure if this works for eczema though but still worth a try, I guess. Just sharing. Hope you and your hubs condition gets better. Btw, happy birthday to Gavin boy and an advance birthday greeting to Kenzie boy. Celebrations in order today? Ooohh, thanks for your birthday wishes to the boys.. Yep, G just turned one and Kz will be 3 next week.. Already celebrated yesterday at my mum's place.. Just a simple dinner, candle blowing & cake cutting.. Ahhhhh!!!! You've tried it too. Seemed to work wonders on Rose's baby! Your boys' birthday? Happy birthday to them, God bless always. No grand celebration? Aiyorrrr!!!! Kids love parties - let them have a bit of fun. Thanks for the wishes.. Yep, G just turned one and Kz will be three on 19th.. No grand celebration la, just a simple dinner at my mum's place..
Wow....looks like a miracle cream. Ezecma can be really torturing especially the itchiness. Hehe, not miracle cream la, it didn't happen in a few days.. 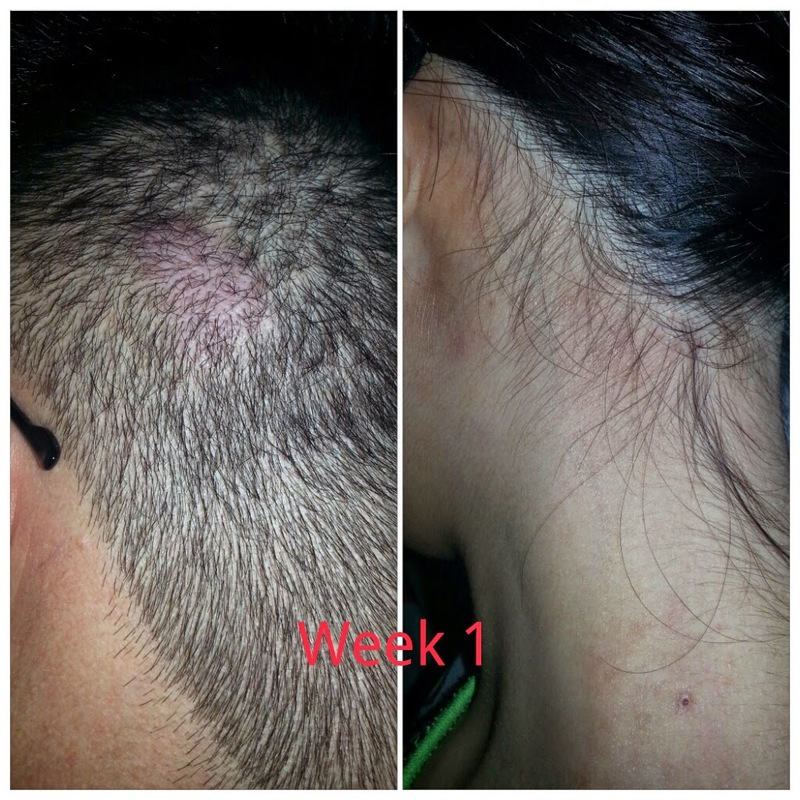 The results took two weeks to show.. Yes, hubby's eczema is bad, as you can see, but now seems like it can be controlled..
Glad it works for both of you. Happy birthday to your boys. Yep, working slowly. Thanks for the birthday wishes. This one looks like a great product ya! Can really see the results. Glad that you found a suitable product! Yeah, steroid-free cream finally, can rub on my skin without thinking twice..
glad that it works on both of you too. I'm sure it has helped to reduce the symptoms gradually. Yeah, can see the results slowly and gradually.. At least it can be controlled now.. I get so geli everytime looking at hubby's bloody patch..